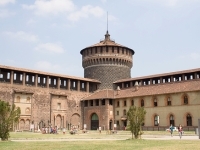 The gargantuan Sforzesco Castle, built in the 15th Century, is one of Milan's foremost monuments. It was restored after being bombed in 1943. The vast interior, which is broken here and there by smaller courtyards, contains three museums, the most notable of which is the Museum of Historic Art (Museo d'Arte Antica del Castello Sforzesco). Within its collection of sculptures is the famous Pieta Rondanini, Michelangelo's final work. The picture gallery features paintings by Mantegna, Bellini, da Vinci and Fra Filippo Lippi. The two other museums within the Castle's ramparts are the Museum of Applied Arts and the Archaeological Museum and there are lots of unusual little exhibitions showcasing musical instruments, Egyptian art and other unexpected things. There is also a quaint little furniture museum. The castle is vast and to explore it properly you will need a few hours. It is conveniently located in the centre of Milan and the relatively cheap admission cost and amount of material to see encourages repeat visits. The castle grounds are big and lovely for a stroll; visitors can enter them free of charge so it is a good place to come for some fresh air. Castles never cease to captivate the imagination and this ancient fortress is rather unexpected in Milan, making it an exciting attraction. Opening times: Castle: Open daily from 7am to 6pm (winter), closing at 7pm in summer. Museums: Tuesday to Sunday 9am to 5.30pm. Admission: Castle: Free. Museums: €5, with concessions available.